The challenge, which used the hashtag #PhDlimerick, was started by the University's Centre for Sustainable Chemical Technologies (CSCT) and has attracted entries on topics from sustainable plastics to sea lion conservation. Professor Davidson said: "At the CSCT we provide our doctoral students with a variety of opportunities to think broadly about improving their communication and public engagement skills, from condensing their research into three minutes with the Three Minute Thesis competition, to working with policy makers and doing hands-on science demonstrations to the public at the Cheltenham Science Festival. "We thought that challenging our doctoral students to write limericks would be fun but both the level of interest and the rhyming skills displayed have been amazing. I hope students from other institutions will continue to get involved and use the hashtag to show us what they can do." She said: "I might be a scientist by day, but I like to do creative and artistic things too. Even so, I never expected I would win a poetry competition! "Limericks are a fun kind of poetry, and it's a challenge to try and sum up complex ideas in only five lines – not to mention making it rhyme too. "I've really enjoyed reading everyone else's PhD limericks. There were some great ones on Twitter. "I'm not sure how successful my limerick was at explaining the ideas to non-specialists, but hopefully it will at least have intrigued people a bit. "I think working with renewable and biodegradable plastics like polylactide is a really interesting research area. 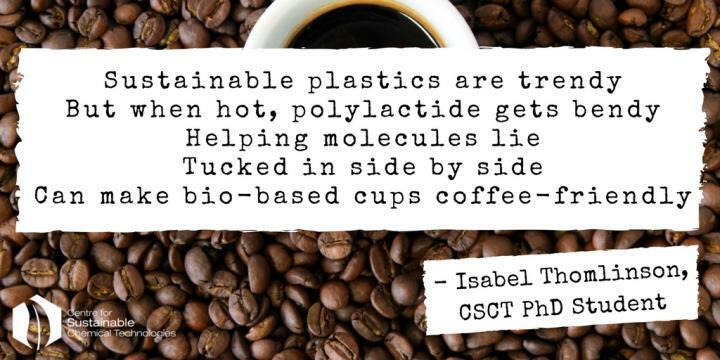 Lots of researchers in the University of Bath's Centre for Sustainable Chemical Technologies are currently working on many aspects of bio-based plastics. Since we all use so many plastic products all the time, these sustainable replacements are really relevant to our everyday lives." The researchers are encouraging others to have a go at the challenge, and hope that next year's limerick competition will attract even more interest.